Recently, you may have seen our feedback request when you logged in to SKYSITE. We take your feedback seriously. In fact, some of our most popular features came from the feedback that you provide. In fact, our latest release, launched June 16th, is comprised of three features that were requested from many of you. Our first, big, new feature is Email Management. We heard from lots of you that have been looking for a way to track and archive all the emails associated with a project. We agree, having all the emails in one safe place will help keep your project on track, document project discussions, create better accountability, and reduce errors due to lost or miscommunications. Email management allows you to have an email archive associated with each project. You can use our new Outlook add-in and setup a project specific email address (like myprojectname@skysiteprojects.com). It’s easy to do and all your synced email is archived and easily searchable. You’ll have all the project email stored in a safe and organized place. Even better, it comes with powerful search and filtering options that allow you to find specific information in a snap. *Available with SKYSITE’s Enterprise package. We’re all trying to use less paper, but sometimes you just really need a print. That’s why we made it super easy to order prints directly from SKYSITE to over 170 global locations. Are you in an office in San Francisco, but your project is in Ohio? No problem. Order from California and print and deliver in Ohio, or even Beijing, or London. We’ve made our print cart intuitive, similar to other online shopping carts. All you have to do is select a file, add it to the print cart, and confirm your order. Instead of ordering one print at a time, you can add all the files you need to your cart, specify print and delivery instructions and checkout when you’re ready. You can even print documents from multiple projects in the same order. Our print locations are all over, and provide professional, wide and narrow format printing services for almost any kind of document, just in case you need a print. 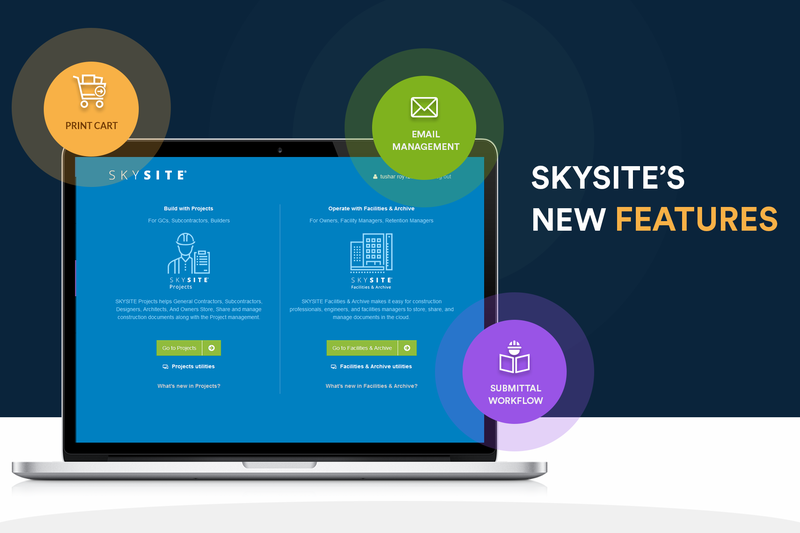 This upgrade is for SKYSITE Projects users. One comment we heard in feedback is that you’d like to use your own submittal workflow. Now, submittals have an open workflow where you can freely pass the submittal to unlimited reviewers, in any order, after creating your submittal package. Simply choose the first reviewer and the team can then pass it along until it’s been viewed by everyone that needs to see it. You can create submittals with a few clicks and keep everything in one place. Your submittals will be easy to send, find, approve and manage. Of course, we still have our convenient submittal templates if you prefer more structure. In the meantime, keep the feedback coming!